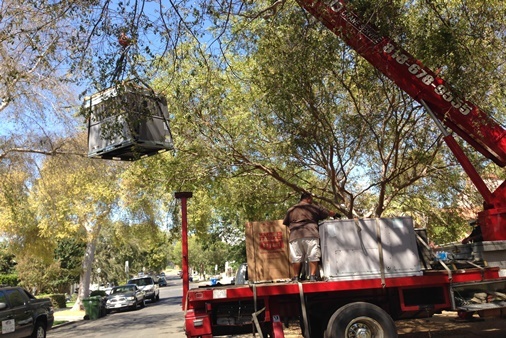 There are numerous reasons why proprietors of residential properties choose to change the location of their heating, ventilation and air-conditioning unit. These reasons could be the need for a residence makeover or renovation, putting it away from locations that might damage or contaminate its filters and then its efficiency. Putting it out of reach from pets or children, or even to make it less conspicuous and safe from theft! These systems however are very delicate systems and while it is possible to do it without experience, the risk is too great to take. The Skill Required – The cost is a function of the amount of care and precision required for this process. This is what makes the cost of relocation so high. For example, when moving a system, extra care is taken to ensure that there is no twisting, stretching or bending of the refrigerant line as any severe bend will most likely result in creating a leak along the pipe. Similarly, the copper line must be replaced by purchase or fabricated by cutting and welding to create new lines of the same dimensions as they all come in certain dimensions. There are definite procedures to take before the move begins. Others include: pumping out all the existing refrigerant, covering all the line sets after insulating it among other things. THE HVAC SYSTEM TYPE – The capacity, efficiency and components of HVAC systems are unique to themselves and the purposes for which they are made. This means that the scope of the design has to be studied. Also, there might be problems peculiar to certain brands. For example, some components of the system might be difficult to reach and knowing the way out of that problem might be easily provided from the wealth of experience of the professional or the costs of certain parts which differ based on the difference of the brands. THE DESIGN OBJECTIVES – This involves the required tubing length, the route of the tubing etc. These details affect the overall cost of the process. There is a need for a thorough understanding of all specifications before relocating so as to fill in any open gap during the process. Should any gap be left opened, then the relocation is regarded as unsuccessful and could lead to loss of labor, capital and time. However, all these points listed above are not fixed costs. They only affect specific situations. It is advised that when moving the HVAC system has been decided, it is best to consult a reputable air conditioning installation service to inspect the cost of the transfer before the budget is drawn or confirmed. Heating, ventilation and air conditioning systems undeniably improve the quality of life in a home. However, the only permanent thing in life is change which means relocation is inevitable and this applies to HVAC systems. In a bid to relocate an the system, it is understood that the primary concern is the skill required while the understanding of the design objectives and HVAC system type can come secondary.